Aqua Marina has proven to be the one brand which can extend to reach newer horizons. Actually, this is a manufacturer that managed to establish a solid reputation within a considerably concise period of time and a rather extended line of inflatable paddle boards. The difference between Aqua Marina and other big names on the market can be summed up in the definition of hard work for each of them. Hence, when looking for a good paddle board, you’ll be faced with a multitude of options that aim at catering for the exact needs and requirements of a variety of users. So, what is it that makes the Aqua Marina Breeze a recommended iSUP for you, and why you should or shouldn’t click that purchase button? Heat embossed, anti-slip EVA deck pad for maximum traction and durability. On board bungee and multiple D rings for holding whatever you need for a fun day out. Starting at the most significant variable amongst inflatable boards and boards in general, size is quite an influencer on your pick but it is especially the case for iSUPs. Accordingly, here is a detailed report on the size and properties of each dimension on the Aqua Marina Breeze. Starting from the most significant point of measurement, the board at hand measures a generic 9 feet which is almost the perfect length for entry-level inflatable paddle boards. Indeed, at this exact length, the board is made compatible with most paddlers out there and that ranges from teenagers and all the way up to adults. Moreover, the board’s length will go on to impact even the performance of the board, making it more poise and a solid tracker. As for the second most important dimension, the Aqua Marina Breeze remains within the safe zone as it measures a subtle 30 inches. For the better of your experience, Aqua Marina decided to stick with the universally approved width on the Breeze for a couple of reasons. First, at this width, the board strikes a sweet length to width size ratio, granting it more stability and responsiveness. Second, the board is also made to be impressively stable and roomy, leaving space for you to move around and adjust comfortably without the constant concern of falling off. Last but absolutely not least, the Breeze goes with a rather humble 4.72 inches in thickness which is as much as you should expect from a board within this price range. Indeed, the thickness is not exemplary but it will definitely confirm the board’s strength and keep you above water in most circumstance as long as you respect the weight limit. Speaking of which, the board at hand offers a maximum weight capacity of 209 pounds which should be enough for most users but if you think otherwise then worry not because Aqua Marina offers a wide range of inflatable paddle boards that you can choose from including but not limited to : Thrive iSUP, Magma iSUP, Vapor iSUP, Fusion iSUP…etc. Quality is definitely a relevant factor here if not the most relevant as it determines just how reasonable or out of reason the price tag is. Luckily however, this entire line of Aqua Marina boards undergoes the same creation scheme. 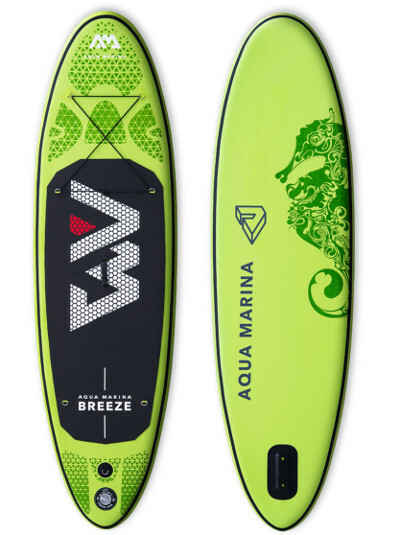 Hence, just like all Aqua Marina iSUP boards on this line, the Breeze also exhibits a skin base of military grade PVC material which is the same stuff that the army uses to build its aquatic arsenal. Indeed, military grade PVC is used to build zodiac boats, military grade swim suits and even some bullet proof vests; making this board virtually tougher than anything else on the market. 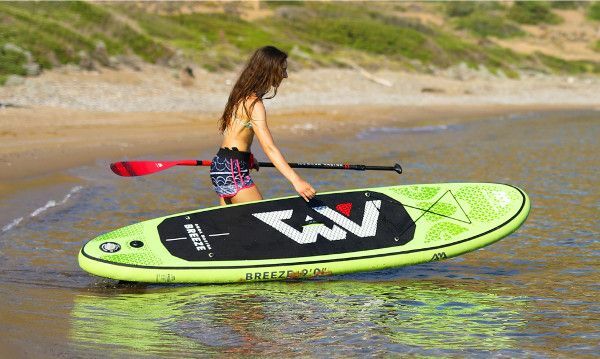 Moreover, the board at hand is even further enhanced via an industrial drop stitch construction which is used with all inflatable paddle boards to tightly seal the seams on the hull and leave no room for error. Indeed, this is an impenetrable build and one which makes the Breeze virtually indestructible. Features is a mandatory review segment which we learned that it’s also the most exciting part about inflatable paddle boards. Indeed, it is the practicality and these little features which set apart inflatable paddle boards from the standard rigid ones and that is why Aqua Marina decided to hook this board up with as much as possible while keeping some authenticity. Starting at the overall design of the board, it is undeniable that the Breeze looks unordinary. Well yes, it floats and tracks just like any other iSUP board but it’s not as sharp. In that respect, it should be noted that this is designed to be an entry level board which is why it’s rather bulky and smoother on the edges. As fun as it would be to own a sharp looking board, for a beginner it will be significantly easier to use the Breeze as compared to something more advanced. So, if you’re not a complete beginner then you can upgrade. Also, the board’s impressive gripping pad situation has got to be one of its best features. Actually, the pad will prove to be extremely practical as you learn your way around it but for starters, it will significantly improve your balance and stability which is key for beginners. Also, the pad’s firm grip will enable you to have a better command over the board and that is pretty neat. Moreover, the board also features a number of D-rings distributed over the surface of the board. On the front, of the board, there are 4 D rings connected via a bungee cord, making an impeccable cargo net (A.K.A : Tie-down system). The net can be used for multiple purposes but most importantly, it can be used to transport / secure anything from your paddle to your sandals. The board also features a couple of rings near the tail which are meant to help you install a kayak seat. It also comes with a single D-ring by the tail which is meant for safety leash attachment. As far as performance is concerned, one thing is for certain and that is that the Breeze is a one hell of an entry level board. Indeed, this might not be the thickest board out there but it’s still very reliable for someone who’s looking for a fun board that would make their summer break a little better. Also, the navigation system on this iSUP is rather impressive. Actually, with a 3 separate fins, you can expect some responsive handling and improved straight line tracking which cannot be said about most boards within this price range.Hence, do not underestimate this board as it is capable of doing whatever a high caliber board can but in a lesser degree. 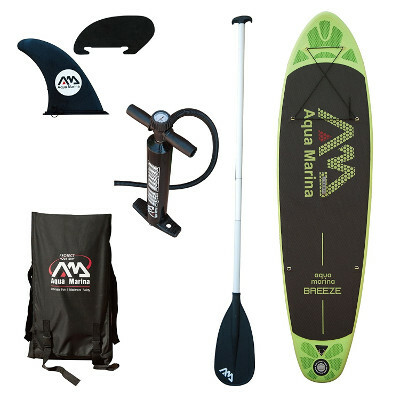 The Aqua Marina Breeze is a budget-friendly inflatable paddle board. It’s designed for entry-level paddlers. It’s a great all-round inflatable paddle board. The Aqua Marina Breeze is just 4 inches thick.